They finally made it. After summer selection camp, the World Junior showcase, a much-anticipated NHL loaner in Victor Mete and a few other late additions who weren’t invited to the summer showcase, the final 22 are setting their sights on Buffalo and their first game against Finland. 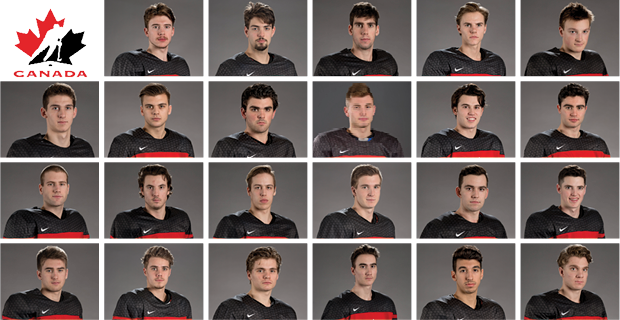 This year’s roster includes seven returning players in Carter Hart, (2013 HN POY) Dante Fabbro, Taylor Raddysh, Dillon Dube, Michael McLeod, Kale Clague and Jake Bean, plus fifteen more who will be looking to impress on the world stage. DOB: 08/13/98 Sherwood Park, Alta. Steps up in big situations and doesn't just make that one big save but shifts the momentum in his teams favour with his con dence. Super consistent. DOB: 03/07/98 North Bay, Ont. Big body that covers the net but moves well for his size. Shows good patience and has exceptional rebound control. Plays strong positional game. Plays a physical game and will throw a big hit, battle in the corners and clears his net in front. Great puck movement in all three zones. Tough to beat one-on-one, plays body well and will come away with the puck. Can quarterback the power play and will shoot the puck whenever he sees the chance. Phenomenal skater who can get up and down ice closing sizeable gaps to get back into position. Exceptional vision. Can make impossible passes tape to tape. Great skater in both directions, quick on his edges and can cover the ice effectively. Hard slap shot and keeps it low which leaves rebounds for forwards to clean up. Knows how to shut down the rush and rarely gets beat on the outside. Natural skater who likes to skate the puck out of the zone and navigates traffic really well. 2013 HockeyNow POY. Smooth skating mobile defender with good vision, rarely panics or turns the puck over. Status: lower body injury could sideline Fabbro's second WJC appearance. Undersized puck-moving D-man who plays strong offensive game – will carry puck deep into offensive zone. Creative playmaker with great vision. Super accurate passer. DOB: 05/05/98 St. Albert, Alta. Late addition to Team Canada pre-tournament. If he makes the cut, Canada will gain smooth skating offensive d-man who brings dangerous weapons from the point. Solid penalty killer, sacrifices his body blocking shots and transits to offence by using breakaway speed out of neutral zone. Creates a lot of turnovers; real, hard shot. Loves to shoot, effective on the power play; plays gritty style. Real competitive and is the type of player you want on your team. Dangerous two-way forward who never gives up and makes something happen most shifts. Tenacious forechecker, good hockey sense. Truly dominant force; has quick separation speed and acceleration combined with a hard, powerful, sizeable strides. Complete 200-foot player. Goal scorer with ability to find open ice. Excellent hockey sense, uses body well to gain advantage and make plays; willing to drive net hard. DOB: 01/07/98 Sylvan Lake, Alta. Incredible scoring touch – sits at 61 points in only 27 games so far this season. Above average skater, great speed, watch out for his hard wrist shot. DOB: 04/27/98 New Minas, N.S. Dangerous on the PP; plays with a chip on his shoulder and makes himself very tough to defend and knock off the puck. Pure skater, combines size and speed to give himself a on ice presence felt by very few in the OHL. Natural leader on the ice. Intimidating presence; will battle hard in front and in the corners with a real physical edge. Has a real long reach that he uses to protect the puck. DOB: 02/03/98 Sherwood Park, Alta. Oozes hockey IQ and has ability to have game either slow down or speed up to his pace. Cycles well along the perimeter and head is always on a swivel. DOB: 09/13/99 King City, Ont. Displays elite speed in all zones on the ice and is relentless on the forecheck. Will get to dirty areas on the ice and battle for space. Brings intensity to every shift; soft hands around the net with a good scoring touch. Strong on the puck and battles well below the goal line. Slick hands and can stickhandle through defenders keeping his head up while still making a pass going at top speed. Real deceptive shot.